Well, I’m a bit disappointed (but not surprised) that the new British prince has not been named Alfred, but I must return to my more mundane life. The heat wave is over, thank goodness, but I am remain aggrieved: bruised and beaten from gardening and various athletic activities, bitten by a variety of bugs, burned by the sun. Consequently I have become completely dependent on, and enraptured with, witch hazel. I can’t get enough. I love its simplicity, its cheapness, its effectiveness, its old-fashionedness. Yet I know little about it–there are so many bottles around the house my stepson asked me what it was, and I had to admit complete ignorance. So I looked it up. Witch hazel (Hamamelis virginica): fruiting stem with flowers and seed. 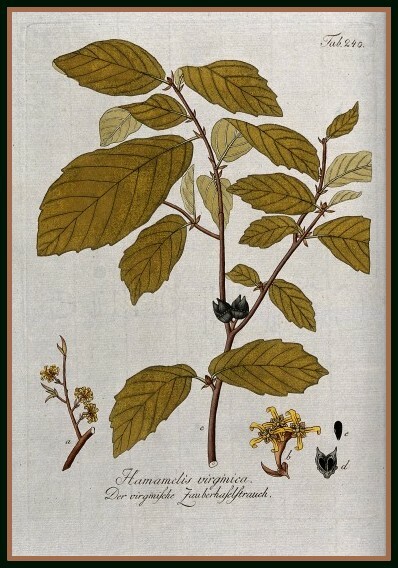 Colored engraving, c. 1792, after F. J. Schultz; Pierre Redouté, Hamamelis Virginica = Hamamélide de Virginie, c. 1801-19, New York Public Library. I do know quite a bit about European medicinal plants and their history, but witch hazel is a North American native (actually there are Asian varieties too) so it doesn’t turn up in any of the medieval or Renaissance herbals with which I am familiar. 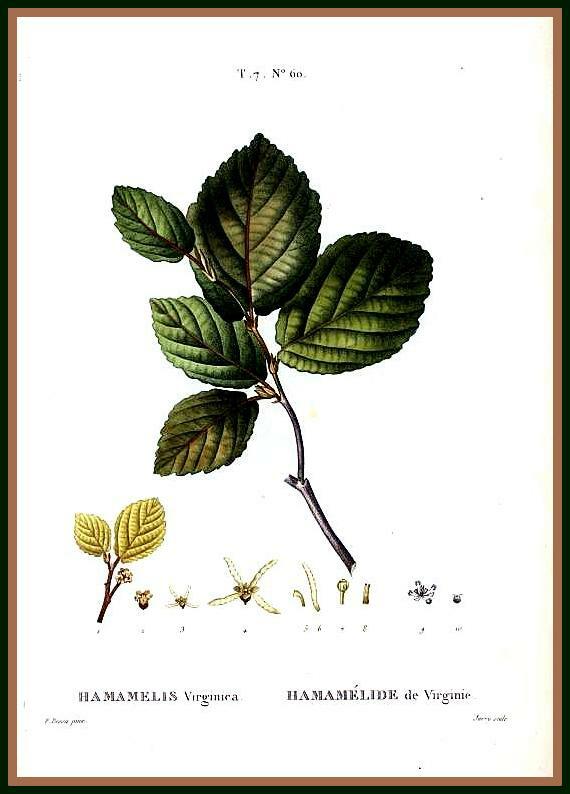 The Native Americans used its bark medicinally, but Europeans (in typical European adaptive fashion) amplified its potency by mixing it with distilled alcohol–and consequently it became a stillrooom/medicine cabinet staple. The standard recipe seems to be 84% witch hazel extract and 16% alcohol today; I’m not sure what is was several centuries ago, but certainly not standard. From past to present, it has been prepared in a variety of forms–poultices, lotions, potions, tinctures and salves–as well as the common “tonic”. 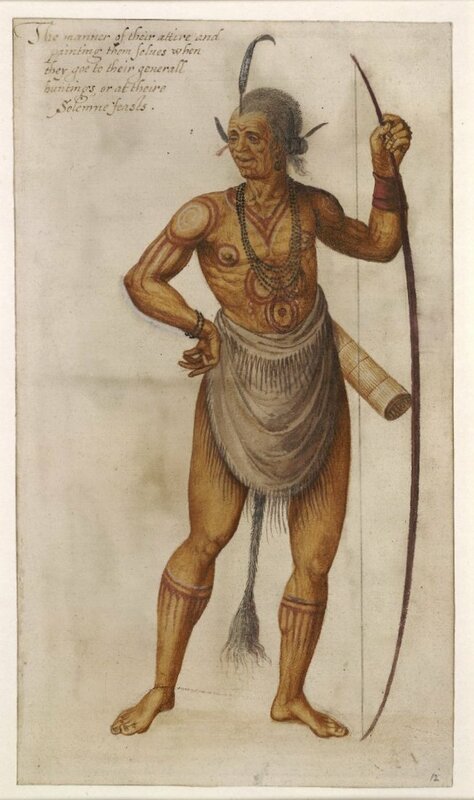 John White’s depiction of a Virginian chief with witch-hazel bow, c. 1585-93, British Museum; an advertisement for Hazeline Witch Hazel, c. 1903, Wellcome Library, London. This latter image reminded me of John Derian‘s apothecary series of decoupage trays, so I clicked over, and there was witch hazel, of course. Apparently the witch hazel shrub is also beautiful, and a very early bloomer: I might have to get one of my own. Or I could just by a print. And lots and lots of more bottles of this panacea. 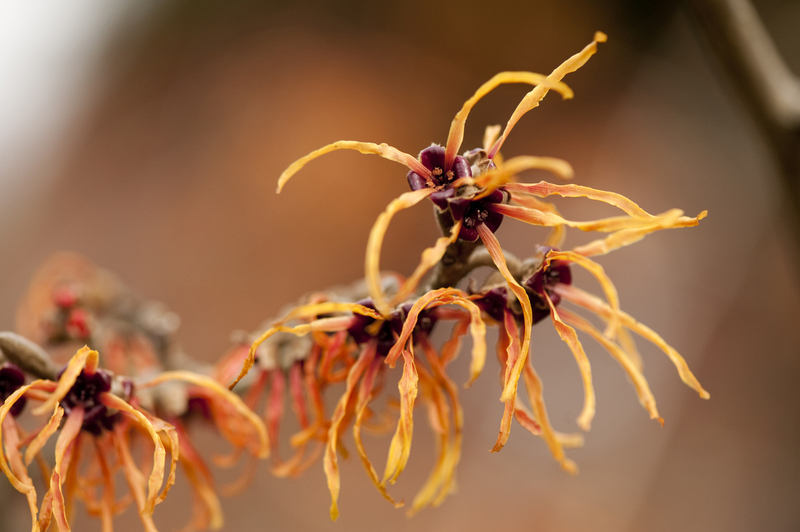 Witch Hazel at the New York Botanical Garden this early spring, photograph by Ivo M. Vermeulen; “Witch Hazels on Salmon Wood” by Kate Halpin, Etsy. This entry was posted on Thursday, July 25th, 2013 at 8:11 am	and tagged with Art, ephemera, Flora and Fauna, horticulture, Photography, Shopping and posted in Culture, History, Nature. You can follow any responses to this entry through the RSS 2.0 feed. 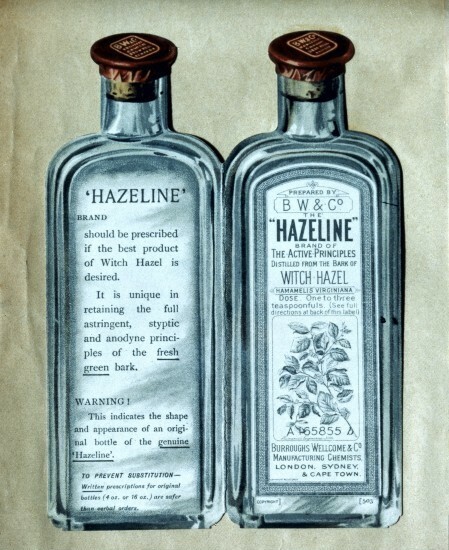 Many years ago when my husband, my sister & I got piercings(eyebrow) they recommended witch hazel to us. I never knew much about it either but I like it a lot too. The plant looks like spiders. Used to always see it in people’s medicine cabinets, where it was known as a disinfectant, but not anymore. I love this plant and had all but forgotten about it! Thank you for reminding me that I have wanted to plant Witch Hazel in my yard for years. I will get right to it! I actually went and looked for some today, but to no avail–I’m going to keep trying.